Smiths Clear Penetrating Epoxy Sealer ™ (CPES™) is a thin epoxy that will penetrate deeply into the surface of wood. It is the original product of Smiths and Co. and has been restoring and protecting for over 40 years now. It is also known as Lignu in Scandinavia and MultiWoodPrime for new wood applications.It is often abbreviated to CPES. Why CPES – Clear Penetrating Epoxy Sealer ™? There is no substitute that performs as well. It is not cheap, but it is significantly cheaper than wood, repainting and maintenance generally. Do it once, do it right. Clear Penetrating Epoxy Sealer is an epoxy product, supplied as Part A and Part B in two tins. You must mix CPES before use. You mix it in a 1 to 1 ratio, and it is tolerant of minor mix errors. To mix by weight, both Cold and Warm formula are mixed at 98 parts A by weight to 100 parts B by weight. Packaged between the two cans is a very comprehensive instruction leaflet. Please read this prior to use if you are unfamiliar with this product. A PDF of that instruction leaflet is available below. Please use the contact page to ask for a copy if you wish for one. Clear Penetrating Epoxy Sealer is capable of restoring rotten wood and allowing it to resist further attack by rot. Often used in conjunction with Fill-It for this purpose to restore the original section of the timber. The marine world loves CPES as the cost of replacing timbers in a wooden boat give a significant incentive to ‘Restore not replace’. It’s extreme marine performance can be used to good effect to repair structural or cosmetic timbers in many other environments. Details on restoration use are found here. Because Clear Penetrating Epoxy Sealer and Fill-It work so well together, we sell repair kits containing both products at a discounted price too. On badly rotten timber, which you can crumble to dust with your fingers, you will typically use 2 or more times the volume of rotten timber in CPES to harden your wood dust. You will however end up with a piece of plasticised wood that you could beat someone to death with. I will often harden wood like this as it can make the restoration of a profile far easier than removing the dust and then filling, even though it is a little more expensive. The solvents can take a long time to evaporate from timber in this state if the sections are large. CPES will find rot that you were not even aware of in less rotted timber; the safest way to estimate requirements is to actually try a section of your rotten timber. If you have a lot to do, I normally recommend you buy a 1.9 litre pack and use that. After treating as much as you can with that you will have an accurate idea of how much you will need for the whole job, if it is not sufficient to do the whole job. Clear Penetrating Epoxy Sealer penetrates deeply into timber, especially so at the end grain. This penetration strongly resists the ingress of moisture, protecting joints and end grain particularly thoroughly. It also promotes adhesion of the top coat, which will bond far more strongly to CPES than to the wood itself, thus significantly increasing the life of the top coat and reducing maintenance costs. See here for full instructions on its use as a primer. Clear Penetrating Epoxy Sealer can be used without a top coat to achieve a natural surface finish on timber whilst protecting it from the elements, see here for instructions for this application. If the wood is old, porous or has suffered significant exposure to sunlight or the elements, it is normally safest to halve these coverage figures (ie you will use double the amount required for new timber). Curing characteristics: Which Formula CPES? Clear Penetrating Epoxy Sealer is available in two formulations, a warm weather and a cold weather formulation. We stock and supply both formulations. For use in the UK Cold Weather Clear Penetrating Epoxy Sealer is recommended, Warm Weather Clear Penetrating Epoxy Sealer should be used if the temperatures will exceed 25 degrees centigrade. Check which temperature CPES you require if you are unsure. Smiths CPES comes in two tins labelled A and B. Mix the two parts 1 part to 1 part by volume prior to use. I find the easiest way is to take a parallel sided jam jar, decide how much you wish to mix, and make marks to suit, say at 4 and 8cm up from the base on the jar. Pour to the marks, and shake gently. Should you wish to mix Smiths CPES by weight the ratio is 98 parts of A to 100 parts of B. Smiths Clear Penetrating Epoxy Sealer is very forgiving of minor mix errors and the only real penalty will be more of one can left than the other when you have finished the job. If you like video’s, there is a short one on this page showing the mixing procedure outlined above. Prior to mixing you will find two metal inserts under the child proof caps. these inserts tightly seal the cans against solvent evaporation. I find these easiest to remove by hammering a small screwdriver through a cap, and prying it out. Solvent evaporation is the main means by which CPES ages. Store the cans in a temperature stable environment such as a cellar, with the caps tightly screwed on. 1.9 litre packs will be useable well over a year later, bigger cans even longer. The resins do not go off or set in the cans. It will remain useable for a surprisingly long time. Brushes likewise will soften again once placed into the container prior to applying the next coat. ALL epoxy resins can cause skin sensitisation. Please always wear rubber gloves when working with Clear Penetrating Epoxy Sealer. The MSDS are available for download on this page, choose the MSDS tab to the left to see them. 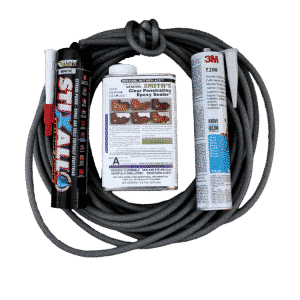 Modern polyurethane caulks, such as 3M 5200, will bind extremely strongly to Clear Penetrating Epoxy Sealer, as will the hybrid caulk Everbuild Stixall. This capability can be used to very good effect to achieve permanently sealed boat hulls, and permanent flexible sealed joints in timber framed houses etc. Have bought a number of litres of this product and used it for wood restoration of cedar hot tub, water proofing marine ply, stabilising window frames. It has great properties of transforming spongy rotting wood into solid workable material. Use with filler for larger repairs. Easy to use, and does the job – CPES is now a “must have” for all my joinery repair projects. 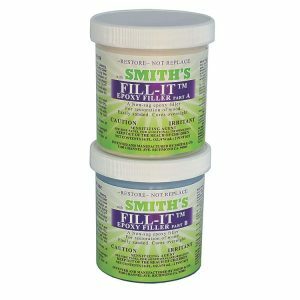 I’ve used it with the Fill-It epoxy filler, and for priming new wood where I’ve spliced in repairs. It’s an excellent primer for the Stand Oil paint that I’m using to decorate doors and windows. An excellent product for rotten windows that needed repair, not replacement. Wood has turned solid in a short time, allowing filler to be added and (hopefully) a long lasting repair. Straightforwards to use if instructions followed. Having tested this on my first window, I’m now onto my next order! solid. I’ve used a 1 litre pack on about 16feet of wooden joists (6″x3) which if probably a bit much. However, they are now shiny and hard isn’t the word for it. I’ve tried to scratch it and knock it, there’s no impact. I’ve also had a good bounce on them and they’re more rigid than the others. Make sure you wash the brush or seal it in plastic bag as it’ll be useless tomorrow! Deck Repair. I used 3 products to repair the delaminating deck on my 33 year old boat. Rain water had found its way into the balsa sandwich between the grp layers and soaked and partially rotted some of the wood. This required drilling numerous holes in the affected part of the deck. After allowing a few weeks for the balsa core to dry out I used a syringe to inject CPES into the affected area to consolidate the wooden core and protect from rot. Layup and laminating epoxy with added silica was then injected to fill any voids. Finally Fill-It was used to fill and fair the holes. I then painted the deck with anti-slip paint. This process seems to have done the trick. The deck is strong and stable. It just remains to be seen if the repair stands the test of time. I found all 3 products extremely easy to work with. Indoor Planters. Instead of lining all my orangery planters with plastic, I decided to use CPES. It was very easy to apply, and so far has worked brilliantly. My planters are on a wall inside, so I did not want water dripping down the wall from my automatic watering system. So far so good, I do keep checking the underside of each planter, and to this point no water is seeping through at all. I should just mention that I did apply a silicone sealant to the joints between each wals and the floor first as well as the CPES. Whilst I was applying the CPES I had a question about multiple coats. I posted the question, and within hours had received a phone call and was talked through exactly what to do. So all in all, for the product and the customer service, I would heartily recommend CPES. Smiths CPES. I can only comment on the short term at this stage. Steve is a very helpful chap – call him with any questions and he always gets back to you. I used CPES on the teak frame on my boats superstructure prior to varnishing, and it has worked a treat. Very happy. Also has worked wonders on repairing some marine ply parts of the superstructure. Recommend both the product (though expensive for sure) and the vendor – top people. Yacht rebuild. Have used CPES as a primer prior to painting on ply interior refit of small yacht. Application is simple and effective, a couple of coats sealed the good quality exterior ply I am using. Paint took well to the sealed wood. Obviously yet to see if it helps the wood last longer in the marine environment. Will update when I know! Yachts. I use CPES as a primer on new wood prior to varnishing with Epiphanes. The CPES is a doddle to use, I use medication measuring cups to achieve the correct mix and just paint it on, it goes on like water. Keep applying until you achieve a shiny surface then apply the varnish before the primer fully dries. I have used this method on many wooden items on my boat, whether used inside or out and have had fantastic results and good longevity of the coating. I use CPES on new items as well as recoating old ones, it is expensive initialy but will reduce the amount of time, money and effort needed to keep wood looking good in the future. It is a lifesaver. This is my third batch of CPES. I will not start any restoration project on my wooden boat without first making sure I have a plentiful supply. It is a lifesaver. CPES. The stuff we brought from you worked very well in curing our soft deck on our Kelly Peterson 44. We are delighted how easy it was when we worked out how to go about doing it. I am ordering some more CPES to do a few more patches. we had plenty of the resin, thinners, and filler left. Had we had it done professionally it would have cost thousands of pounds not £225!! CPES. Useful for special applications but rather expensive for regular use. Cpes. Great product that works, just feel it’s a little too expensive. 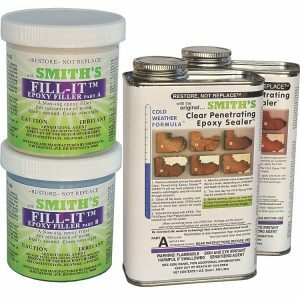 Smiths Clear Penetrating Epoxy Sealer (CPES). Well I purchased this to help me carry out repairs on my wooden fishing boat. It seems perfect for my application. I had some wood rot that had penetrated the surface on oak and teak.. This was dug out and I dried the goodish wood as much as possble treated with rot killer then soaked the wood with the epoxy mix, left it for a week to cure. It makes a good hard rough base to then fill with normal expoxy and filler mix. I used it on different types of wood, always digging out as much of the loose stuff as possible.Results look great, only time will tell if it is still good in a year or two. I will try to remember to report back. The guy on the phone could not have been more helpful. Total oldschool specialist. Brilliant service and advice. Fingers crossed this has saved me a fortune and a load of work replacing planks. Great product. Customer service and delivery excellent and speedy. Simple product to use. Enters wood very easily. Saved several thousand pounds in dismantling a roof to replace lightly rotted roof apex beam- what’s not to like/ Absolutely solid now. CPES. I’m writing this review based on the fact I keep ordering the product!!! Why? Well I’m restoring a 1934 Dunkirk little ship and found that CPES is an effective sealer and forms a good bonding surface in which to apply other products to like resins. It does toughen the timber as stated although you need a lot of it to effectively do this, weaker areas benefit from the application and I feel more confident about the timber not rottinging when I apply resins inside and out on the hull. I have decided to use CPES throught the boat although it’s expensive and only available in small qtys which is a bit frustrating, I feel it’s worth it on such a restoration. Epoxy as a wood finisjh. I forgot to add, I sanded an area of teak decking that always weathers bad. Got back to good wood. I coated the teak in 2 coats of the epoxy and it brought the wood back to its former glory looking better than any varnish or wood oil that I hve previoulsy tried. It looks really hard wearing and has soaked into the wood rather than sitting on the surface. I have high hopes of this lasting well. Great product. The fumes blow your mind, but its workth it! CPES. Did the job of consolidating rotten hardwood with a complex profile well. Be patient, it takes as much as a week for the solvent to evaporate and the resin to harden, even in summer. Garden Railway: Sealing Plywood Edges. I used the product to seal the cut edges of the marine ply boards I employed in constructing my garden railway. Only time will tell how durable the boards now are, but the product was easy to use, and seems to have penetrated and filled the wood effectively.